Maintaining your cat or kitten's health is always a wise investment of your time. If you ensure you carry out regular check-ups with your vet, and generally monitor your cat's health on a daily basis, you can prevent many illnesses or ailments developing in the first place. It's definitely recommended that you take your kitten or cat to the vet as soon as you become its owner - and before it comes into contact with any other cats you may already have in your home. A vet will advise you on the most appropriate vaccination schedule for your pet and, even if your cat or kitten is in good health, you should ensure it has a general check-up at least once a year. become tuned into its habits and behavior - it's eating, drinking, sleeping, playing and bathroom routines. This means you will be likely to quickly detect anything unusual when your cat is under the weather. Many health problems can be nipped in the bud quickly, as long as you identify them in the early stages of development. You cannot give your cat or kitten too much love, care and attention - it will become an important part of your life and, as such, deserves to be treated with devotion at all times. Providing a healthy environment for your cat is vital for its general well-being. A clean and safe home will help to keep your cat healthy and happy. It's also important to pay the utmost attention to your cat's nutrition. Poor quality food will ultimately lead to poor quality health in your cat or kitten. And you should never forget the benefits of ensuring your cat gets plenty of exercise - play time is a great way to keep your moggy in tip-top condition. If you give your cat plenty of exercise and keep it stimulated during the day it will enjoy enriched rest and sleep in the evening. Carrying out a regular check-up of your cat is also highly recommended - some owners do it on a daily basis. And of course you should call your vet immediately if you notice anything unusual. You should start at the head and check in the ears for mites, and any sign of a buildup of wax. Then check the eyes for any signs of discharge and then the gums for signs of tartar build-up. 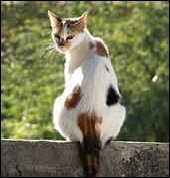 Next check your cat's body for lumps, sores, fleas, parasites and anything else unusual. Brushing is also important for your cat's overall health and is an important way to remove loose hair, fleas and dead skin. You should also clip your cat's claws regularly as failure to do so can sometimes lead to them growing into the paw pads. And always remember to ask your vet for advice if you aren't sure about carrying out any of the procedures necessary to maintain your cat's health - and also seek guidance on any medication which may be required.